Don’t fuel your mind with bad information. Learn to separate facts from fiction. 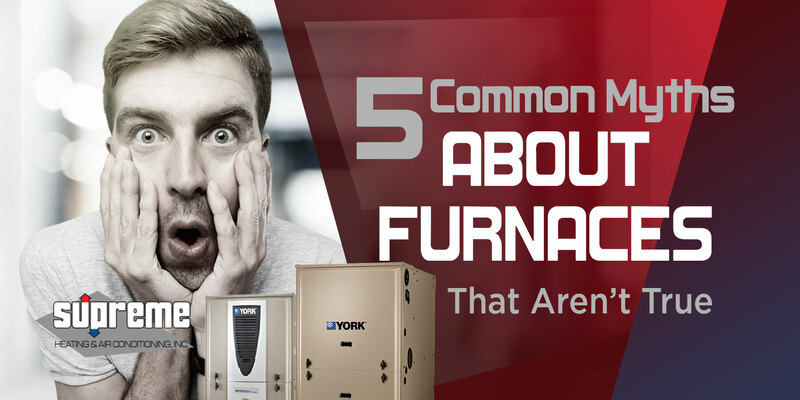 Here are common myths about furnaces that will clear your thoughts. Read to learn more! Some say that having the most energy-efficient furnace is enough to keep high bills at bay. Well, they’ve got it wrong! While having an efficient heating system is necessary, it does not mean that other things inside the house should no longer be optimized for heating. If you are trying to reduce your energy bills, you need to check other factors like insulation and thermostat setting. Unluckily, the airflow in your home does not work like this. When you close the vents, you increase the air pressure inside the ducts which may result in leaks in the vent’s seams. Experts always recommend keeping the vents open and free from dirt and debris to maximize its performance and efficiency. Do you think so? The location of your thermostat actually matters a lot more than you will ever know. For instance, placing the thermostat near sunlight or air vents put you at risk of false temperature readings. This means that your home will not be properly heated. Where’s the best place to position your thermostat? Place it on the interior wall away from the sun’s rays and vents. Another false belief! When it comes to heating your home, thinking that bigger systems work better does not make any sense at all. You will end up installing a unit too big that will eat up a great amount on your energy bills. The worst thing that could happen to your system is short cycling which can drastically lessen its lifespan. Always consult the experts for the right size of furnace for your home. This is completely false! All heating systems regardless of their type and age require regular tune-ups and maintenance to keep them working at the utmost performance. Routine maintenance prevents your system from sudden failures and detects hidden issues that may turn into bigger problems soon. These myths might lead you to confusion about your HVAC system. We at Supreme Heating and Air Conditioning Inc. do not want you to end up making the wrong actions and decisions concerning your heating and cooling system. We’re here to guide and assist you. Contact our specialists for assistance.